Product prices and availability are accurate as of 2019-04-18 00:19:49 UTC and are subject to change. Any price and availability information displayed on http://www.amazon.com/ at the time of purchase will apply to the purchase of this product. 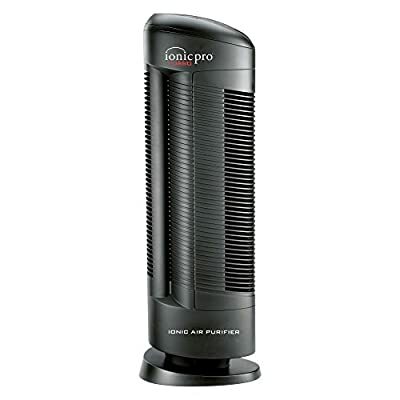 The Ionic Pro TURBO TA500 Ionic Room Air Purifier is silent when in use yet removes unpleasant odors, allergens, and pet dander in a room up to 500 square feet. This convenient air purifier moves 300% more air than similar ionic air purifiers and has no filters to replace. Front-loading collection blades make clean-up easy. About Lasko Since 1906 Lasko has been providing innovative, superior quality home comfort and convenience products at outstanding values. Lasko is based in the United States. They use state of the art technology and equipment to make their products and rigorous testing and quality standards to ensure each product is superior. Performance, quality, and value - the Lasko advantage. Purifies air in rooms up to 500 square feet. Silent, yet moves 300% more air than similar units. No filter to replace - collection rods trap impurities. Easy-to-use one-touch operation, easy to clean. Air purifier dimensions: 9.5L x 7.25W x 28H inches.